Maybe John Tortorella was right. There really may be nothing like playing guilty in the NHL, a hot streak the product of getting caught on camera badmouthing your coach. Or maybe it has simply coincided with the fact that his agent engaged in meaningful contract extension talks. Regardless the reason, no player in the NHL has more points than Matt Duchene since the Uber video story broke on Nov. 5. He has six goals and nine assists for 15 points in just seven games. Duchene has nearly double the amount of points (15) as league leaders Mikko Rantanen (eight) and Nathan MacKinnon (eight) over the last two weeks. That run has Duchene nipping at the Avs stars’ heels now. It has catapulted Duchene into a tie for fifth in the league’s scoring race with 27 points, just one back of Connor McDavid and five behind Rantanen for the lead. It’s hard to tell what’s been more impressive: that Duchene is coming off back-to-back three-point games and has four in this two-week streak, or that the bulk of his production has directly benefitted the Sens’ scoresheet. Of Duchene’s 17 assists this season, 15 of them are primary, making him second only to Toronto’s Mitch Marner in first assists in the NHL this season. Duchene, 27, is going to become an uber-wealthy man soon, pardon the pun. 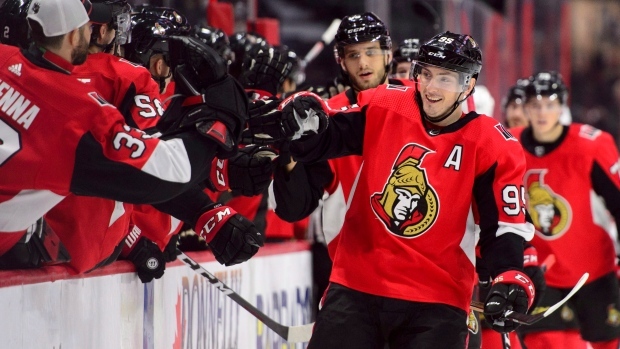 TSN Hockey Insider Bob McKenzie reported on Tuesday that extension talks have been progressing between Duchene’s camp, agent Pat Brisson of CAA Sports, and Senators GM Pierre Dorion. The two sides met face-to-face last week in Toronto. Duchene is in the final year of a five-year, $30 million deal signed with the Avalanche. He has been eligible to sign an extension since July 1. McKenzie reported it’s premature to say a deal will get done, but his best guess was Duchene could land somewhere north of $64 million on an eight-year contract. Mark Stone is still the Senators’ No. 1 priority, though he isn’t eligible for a new deal until after Jan. 1, but Duchene is a close second. Duchene’s play and a long-term contract would allow Dorion to save face from a trade that saw the Sens send a non-lottery protected first-round pick to the Avalanche, along with Kyle Turris to Nashville, in a three-team trade last November. He said he was comfortable in Ottawa, three hours from his Haliburton, Ont., home, but wanted to take his time making a decision. The Senators’ start, Duchene said, would dictate his decision.